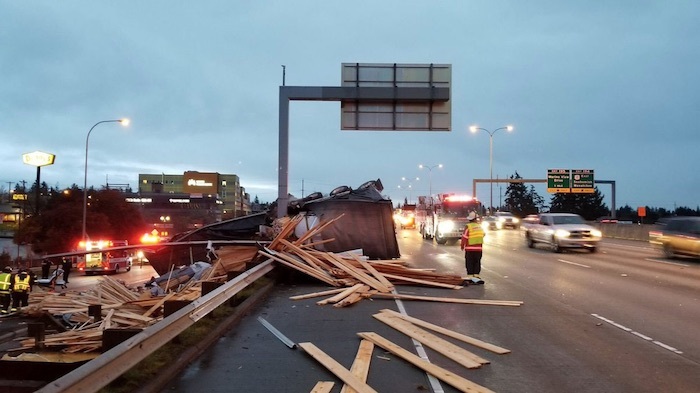 Multiple vehicles crashed and a semi truck dumped its load of lumber in an injury collision on Interstate 5 in Everett on Friday morning, according to the Washington State Patrol. The incident occurred around 6:15 a.m. in the southbound lanes of I-5 near Pacific Avenue. Police say the chain reaction crash began when one car switched lanes and clipped a pickup truck. The causing vehicle spun around and slammed into another car. A semi truck came upon the accident and tried to avoid the wreck, but went over the embankment and down onto the on-ramp from Pacific Avenue to southbound I-5. Two people, including the driver of the semi truck, were injured. One passenger was taken to a local hospital. The semi driver has significant injuries, officials say, and may have suffered a concussion. Two cars had minor damages, the third car sustained significant damage. No fuel was spilled onto the roadway. Two lanes were blocked at the accident scene where the semi truck rolled, causing a 3 mile backup. The on-ramp from Pacific Avenue was fully blocked as well. Further details are not available. The incident remains under investigation. 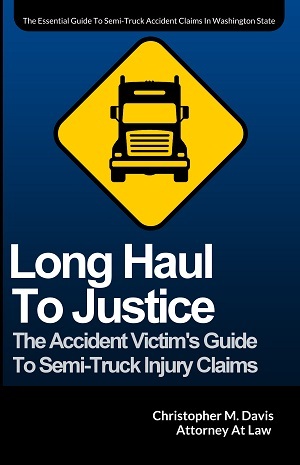 In accidents involving a semi truck, determining liability can quickly become complex. Not only are these accidents more severe and potentially deadly, but there are numerous potential at-fault parties that can be blamed for the incident. Trucking companies, their insurance carrier and the lawyers that represent them are likely already taking an aggressive approach in the hours after an accident. Because the potential damages are so high, these companies have an incentive to try and control the narrative and downplay the severity of the crash. It’s not uncommon for lawyers to try and negotiate settlements with injured people while still in the hospital. Various experts may be hired to prove different aspects of the case, including accident reconstructionists, doctors, engineers, etc. The Washington state semi truck accident attorneys at Davis Law Group have extensive experience handling these cases, and have secured millions in compensation for victims. You can trust that we will fight for your right to receive the settlement you deserve if you have been hit by a semi truck. Contact us today for a free case evaluation. Call (206) 727-4000, use the chat feature below or fill out the form on the contact page to get started.